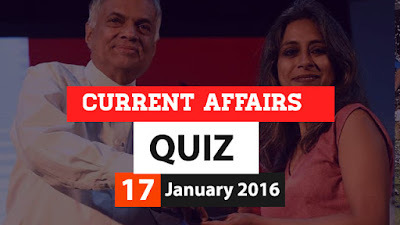 Hi Aspirants..Here is the Current Affairs Quiz for 17 January 2016. Trending topics include Anuradha Roy winning DSC Prize for South Asian Literature, Start-up India, Stand-up India, Asian Infrastructure Investment Bank (AIIB), 61st Britannia Filmfare Awards 2016 etc. This quiz will be useful for all upcoming exams including LIC AAO 2016, Railway RRB 2016 etc. 1) Indian writer Anuradha Roy on 16 January 2016 has won the prestigious $50,000 DSC Prize for South Asian Literature for her novel? 2) Prime Minister Narendra Modi on 16 January 2016 has unveiled the ‘Start-up India, Stand-up India’ action plan in New Delhi to boost ____ in the country? 3) Who among the following on 16 January 2016 formally opened Asian Infrastructure Investment Bank (AIIB) in Beijing? 4) Tsai Ing-wen was on 16 January 2016 elected as first female and 14th President of which country? 5) Juvenile Justice (Care and Protection of Children) Act, 2015 came into force 15 January 2016. Which ministry is looking after its implementation? 6) Indian tennis player Sania Mirza and her Swiss partner ____ have recently won the 2016 WTA Apia International title in the women’s doubles category? 7) Which was adjudged Best Film in the 61st Britannia Filmfare Awards 2016? 8) Which organization on 14 January 2016 released a report titled World Development Report 2016: Digital Dividends? 9) Who won the Best Actor award at 61st Britannia Filmfare Awards 2016? 10) Who won the Best Actress award at 61st Britannia Filmfare Awards 2016?